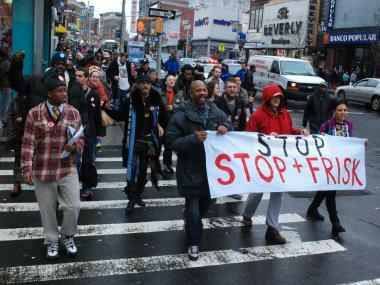 Protesters march in Mott Haven on Jan. 27, 2012 to denounce the police policy of stop, frisk and question. NEW YORK — A defiant Mayor Michael Bloomberg came out swinging against opponents of the NYPD's controversial stop-and-frisk program — vehemently defending Police Commissioner Raymond Kelly and saying that a majority of supporters support the practice despite a growing chorus of critics. The staunch defense came as a Manhattan federal court judge ruled that a lawsuit against stop-and-frisk practices can proceed as a class-action case, potentially paving the way for thousands of plaintiffs to join. After a light-hearted press conference announcing that the Mets would be hosting baseball's 2013 All-Star Game, the mayor tore into critics of stop-and-frisk, the department's practice of stopping suspicious-looking people on the street and frisking them — nearly 700,000 people last year. "If you went out and surveyed the public, you'd find overwhelming support for what we're doing," Bloomberg said. "And a handful of people who have a right to express themselves feel differently." The mayor added that the policy has gotten some 6,000 guns off the street over the past eight years and that Kelly's policing has helped save 5,600 lives over the past 10 years. "Nobody should ask Ray Kelly to apologize — he's not going to and neither am I — for saving 5,600 lives," Bloomberg said. "I think it's fair to say that stop-question-and-frisk has been an essential part of the NYPD's work. "This year we're on pace to have the lowest number of murders in recorded history, and not just by a little, but by a lot. We are not going to do anything that undermines that trend, or threatens public safety." Meanwhile, a Manhattan federal court judge ruled Wednesday that a lawsuit filed against stop-and-frisk can proceed as a class-action suit. Calling the NYPD "cavalier," Judge Shira Scheindlin said the stop-and-frisk program displays a "troubling apathy" towards New Yorkers' most fundamental rights. The class-action status may allow thousands of other plaintiffs to join onto the case, which was filed in 2008 by four men who claimed that they were repeatedly stopped and frisked, according to reports. Of the nearly 700,000 street stops the department made last year, more than 90 percent of the stops did not result in an arrest. A report released by the New York Civil Liberties Union (NYCLU) said the percentage of black and Latino New Yorkers frisked by the cops was substantially higher than their white counterparts elsewhere in the city last year. Bloomberg and Kelly have been vocal proponents of the program, arguing it has driven down the city’s murder rate to its lowest since 1990.